You’d think the longest hits out of Yankee stadium would have been during baseball’s recent and notorious juicing era, when even A Rod admitted to using steroids. But the closest anyone has come to hitting the ball out of the park was in 1963. Mickey Mantle cranked a home run all the way to the stadium’s facade–an area 363 feet from home plate and still over 100 feet off the ground. A lot of these little stories are hidden within Pop Chart Lab’s latest infographic creation, A Bronx Baseball Breakdown. 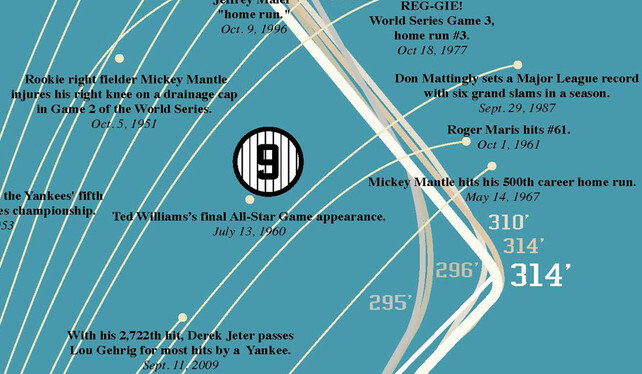 It combines almost 100 years of Yankee history across their two stadiums, and maps these historic moments to the field itself. It’s a testament not just to Yankees history, but to baseball’s meticulous records of nearly every hit and pitch of every game in history. The poster blooms with home runs, and Mickey Mantle’s, of course, sticks out with a legendary preposterousness worthy of speaking half a century of debates involving pitch speed, bat angle, and precise trajectory. But it also showcases history that occurred on the field itself, from Lou Gehrig’s emotional “luckiest man” speech of 1939 to Derek Jeter’s painful dive into the stands of 2004. And if you’d like a copy of your own, 500 signed, limited edition prints (18″x24″) are available for $20. Buy one here.